Preupgradecheck reported the issue: The following feature(s) are referenced by the content, but they are not installed on the web server. What is this? and how to deal with this? Well, this occurs when you have faulty feature in the SharePoint environment. This will be our primary analysis and reporting tool providing us with invaluable information regarding your SharePoint 2007 farm and actions that may be required to be taken prior to upgrading to SharePoint 2010. It is good to have October CU:http://support.microsoft.com/kb/976730/ where the preupgradecheck is enhanced further. You can Find and delete faulty feature from the farm using Feature Admin Tool. This is a very handy tool,make sure you test before you remove these faulty features. Removing these features should fix most of the errors on the pre-upgrade check. Verifies if the feature definition files for all installed features are present on the file system. Also allows to verify if the features used in site collections an sites are installed on the server. This command will verify all features on the server and in the site collection. Some times, STSADM.EXE -o deactivatefeature may fail. his tool allows to remove the feature from the site or site collection completly. You can use SharePoint Manager from Codeplex. This it really very worthy article, my great pleasure have found your web page,In fact helps me to ascertain pleasant and valuable information. 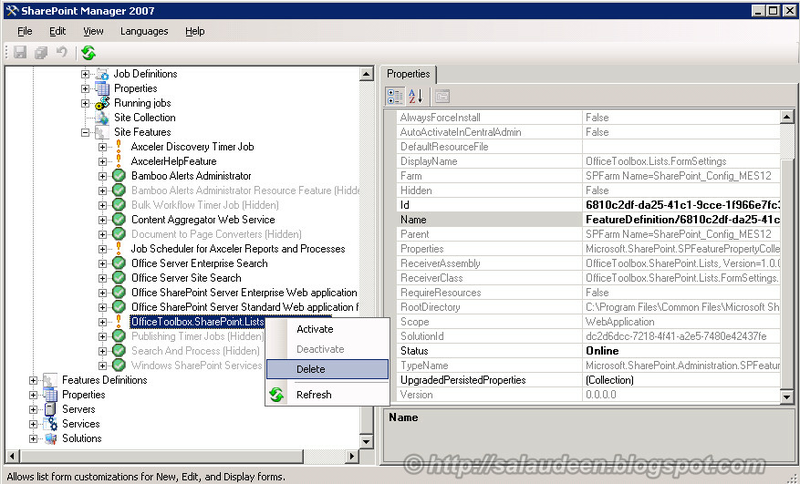 The SharePoint Admin screen shot shows a delete site feature menu option that does not exist on my installation. I do you enable delete site feature? If the feature is invalid and not in use: Delete!